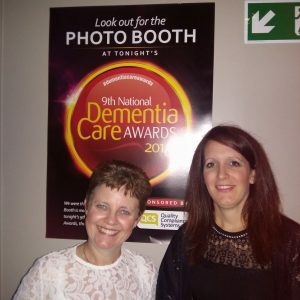 Following the Dementia Congress, on the 8th November Dr Michelle Heward and Dr Michele Board were invited to represent the DEALTS 2 team at the National Dementia Care Awards, following the programme being shortlisted for the Best Dementia Care Award. The evening was full of glitz and glamour with the dress code being ‘black tie’. Following a three course meal, finalists and the winners of the 14 categories were announced and celebrated. We had a fantastic night celebrating the hard work and dedication of so many individuals and teams from the dementia field, and although we did not win the category, we were delighted to be shortlisted for this prestigious national award.